Long ago, in a little island called Ithaca, on the west coast of Greece, there lived a king named Laertes. His kingdom was small and mountainous. People used to say that Ithaca “lay like a shield upon the sea,” which sounds as if it were a flat country. But in those times shields were very large, and rose at the middle into two peaks with a hollow between them, so that Ithaca, seen far off in the sea, with her two chief mountain peaks, and a cloven valley between them, looked exactly like a shield. The country was so rough that men kept no horses, for, at that time, people drove, standing up in little light chariots with two horses; they never rode, and there was no cavalry in battle: men fought from chariots. When Ulysses, the son of Laertes, King of Ithaca grew up, he never fought from a chariot, for he had none, but always on foot. If there were no horses in Ithaca, there was plenty of cattle. The father of Ulysses had flocks of sheep, and herds of swine, and wild goats, deer, and hares lived in the hills and in the plains. The sea was full of fish of many sorts, which men caught with nets, and with rod and line and hook. Thus Ithaca was a good island to live in. The summer was long, and there was hardly any winter; only a few cold weeks, and then the swallows came back, and the plains were like a garden, all covered with wild flowers—violets, lilies, narcissus, and roses. With the blue sky and the blue sea, the island was beautiful. White temples stood on the shores; and the Nymphs, a sort of fairies, had their little shrines built of stone, with wild rose-bushes hanging over them. Other islands lay within sight, crowned with mountains, stretching away, one behind the other, into the sunset. Ulysses in the course of his life saw many rich countries, and great cities of men, but, wherever he was, his heart was always in the little isle of Ithaca, where he had learned how to row, and how to sail a boat, and how to shoot with bow and arrow, and to hunt boars and stags, and manage his hounds. The mother of Ulysses was called Anticleia: she was the daughter of King Autolycus, who lived near Parnassus, a mountain on the mainland. This King Autolycus was the most cunning of men. He was a Master Thief, and could steal a man’s pillow from under his head, but he does not seem to have been thought worse of for this. The Greeks had a God of Thieves, named Hermes, whom Autolycus worshipped, and people thought more good of his cunning tricks than harm of his dishonesty. 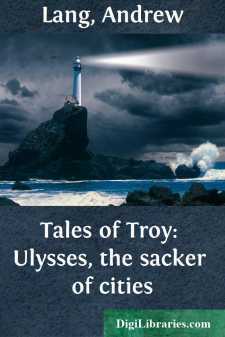 Perhaps these tricks of his were only practised for amusement; however that may be, Ulysses became as artful as his grandfather; he was both the bravest and the most cunning of men, but Ulysses never stole things, except once, as we shall hear, from the enemy in time of war. He showed his cunning in stratagems of war, and in many strange escapes from giants and man-eaters.